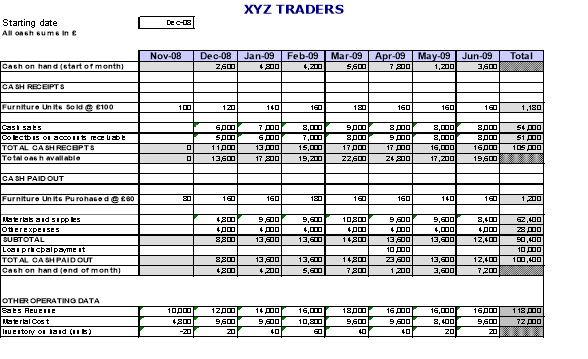 In this report Part A presents a cash budget for XYZ Traders for the six month period from December 2008 to May 2009. Part B comments on the cash flow forecast and outlines the benefits of improved cash flow for the Company and recommends management consider a cash flow improvement program. This report recommends Alfa Manufacturing introduce a budgetary control system. Section A outlines the purpose and benefits of budgets and Section B describes two possible budget formats, incremental and zero based budgeting and examines the advantages and disadvantages of each method. The primary purpose for introducing a budgeting system is to provide the Company with a powerful tool for planning and monitoring business performance. It improves productive effectiveness and enhances coordination between the various arms of management to achieve the overall Company aims. Budgets represent the primary means of communicating agreed-upon objectives throughout the organization. A budget is a formal written statement of the Companies plans for a specified time period. The principle element of a budget is to plan and predict future income and expenditure against a time-scale, usually on a monthly basis covering a calendar or accounting year. Actual income and expenditure is recorded as it occurs and monitored on a regular basis against the plan or budget. The differences between planned and actual results are monitored, reported and the variances analysed and explained. Management must develop a comprehensive plan for the future. Key objectives are agreed for monitoring and performance evaluation. Potential problems are identified well in advance. Coordination of activities within the business is facilitated. Management is more aware of the Companies overall operations. Each level of management participates in the planning, preparation and monitoring of financial activity. The budget must have the complete support of top management and is an important tool for measuring and evaluating managerial performance. Contemporary budgeting has been defined as a system wherein managers are provided with the flexibility to utilize resources as required, in return for their commitment to achieve certain performance results (Deloitte Touche Tohmatsu, 2008). This section contrasts and compares two basic budgeting methodologies currently in use in industry today, Incremental Budgeting and Zero Based Budgeting. Incremental Budgeting (IB) is the traditional approach to budgeting which relies on historical information and the previous years budget as a basis for the preparing the input and data for the following year’s budget. For example, let’s say last year’s sales budget was for 1000 units at £500, giving sales revenue of £500,000. For next year’s budget the market for the product is anticipated to improve by 10% giving unit sales at 1100 thus giving budget sales revenue of £550,000. Similarly costs would be based on last years budget, modified by projected inflationary factors. Anticipated raw material price increases and labour rates are used in the cost of production and increases in say, rent and utilities would reflect in overheads. Managers will prepare their individual budgets based on a series of pre-determined criteria and assumptions which are normally provided by top management, finance and accounts. Zero Based Budgeting (ZBB) is an approach to budgeting that starts from the premise that no costs or activities should be factored into the plans for the coming budget period, just because they figured in the costs or activities for the current or previous periods. Rather, everything that is to be included in the budget must be considered and justified. (Chartered Institute for Public Finance and Accounting, 2006). Another definition is the use of budgets which start from a present base of zero and regard all future expenditure as being on new items rather than a continuation of existing ones. In practice this means that a budget has to be justified in full for each year of operation (Steven A. Finkler, 2003). In implementing this process each manager must critically examine his own activities and operations and build his budget from scratch. Since Alpha Manufacturing has no previous experience of budgetary control it is recommended that an Incremental Budgeting program is introduced initially. The budget can be prepared using historical data with guidelines and assumptions provided to each manager by the Finance Department. This report examines the budget and actual results for October. It flexes the budget to actual output, provides a variance analysis and identifies possible causes for each negative variance. Managerial accountability for each variance is suggested and possible remedial actions for the unfavourable variances identified. The benefits of using flexible budgets are explained and it is recommended that this technique be introduced as a feature of Beales’ regular budget reviews. Table1 shows the results of the budget and actual output for October, flexed to actual output with each variance examined for possible causes, accountabilities and suggested remedial actions. Static budgets have the disadvantage of providing a single specific predicted volume of output. In reality, it very unlikely that the actual output exactly matches the budget. Thus any comparison of actual output to budget suffers from the problem that some of the variances, particularly for variable costs such as labour and materials, will be as a direct result of the differences in the volume of output. For Beales Manufacturing to make the best use of the budgeting process it is recommended that flexible budgets are prepared each month. Variance analysis as demonstrated above will assist management to implement contingency plans to correct any unfavorable trends and enhance profitability. This section defines and describes the principles of Standard Costing. It is an accounting technique which provides a powerful tool for management to analyze business performance and plan improvements. An example of a standard cost is derived from the October budget and the use of variance analysis to identify problem areas and possible remedial actions. The best way to illustrate the benefits of standard costing is to use the October budget data to arrive at an example of a Standard Cost. This cost can then be compared with the actual unit cost for October and the variances analysed as shown in Table 3 below. From this analysis specific product cost information can be derived. For example, although raw material costs per meter were below standard cost, more material than standard was required to complete the production schedule. Why was that? The manager responsible for production will be able to use the information to investigate the unfavourable variance. Possibly scrap rates were excessive so improved quality control could help reduce or eliminate the problem. Raw material costs were also above standard which will alert the purchasing manager to an overrun of purchasing costs which may require action. We recommend that Beales consider the introduction of Standard Costing to provide management with a powerful tool to improve efficiency, productivity and product profitability. "Factors in Business Cash Budgeting: With Examples." UKEssays.com. 11 2018. All Answers Ltd. 04 2019 <https://www.ukessays.com/essays/accounting/factors-business-cash-budgeting-6232.php?vref=1>. "Factors in Business Cash Budgeting: With Examples." All Answers Ltd. ukessays.com, November 2018. Web. 25 April 2019. <https://www.ukessays.com/essays/accounting/factors-business-cash-budgeting-6232.php?vref=1>. UKEssays. November 2018. Factors in Business Cash Budgeting: With Examples. [online]. Available from: https://www.ukessays.com/essays/accounting/factors-business-cash-budgeting-6232.php?vref=1 [Accessed 25 April 2019]. UKEssays. Factors in Business Cash Budgeting: With Examples [Internet]. November 2018. [Accessed 25 April 2019]; Available from: https://www.ukessays.com/essays/accounting/factors-business-cash-budgeting-6232.php?vref=1.